University of Nebraska Press, 9780803236479, 232pp. Lee Martin tells us in his memoir, “I was never meant to come along. My parents married late. My father was thirty-eight, my mother forty-one. When he found out she was pregnant, he asked the doctor, ‘Can you get rid of it?’” From such an inauspicious beginning, Martin began collecting impressions that, through the tincture of time and the magic of his narrative gift, have become the finely wrought pieces of Such a Life. Whether recounting the observations of a solemn child, understood only much later, or exploring the intricacies of neighborhood politics at middle age, Martin offers us a richly detailed, highly personal view that effortlessly expands to illuminate our world. At a tender age Martin moved to a new level of complexity, of negotiating silences and sadness, when his father lost both of his hands in a farming accident. His stories of youth (from a first kiss to a first hangover) and his reflections on age (as a vegan recalling the farm food of his childhood or as a writer contemplating the manual labor of his father and grandfather) bear witness to the observant child he was and the insightful and irresistible storyteller he’s become. 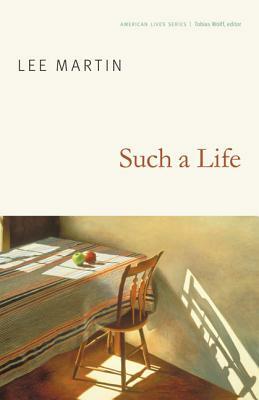 His meditations on family form a highly evocative portrait of the relationships at the heart of our lives. Lee Martin is a professor of English and teaches creative writing at Ohio State University. He is the author of the novels The Bright Forever, finalist for the 2006 Pulitzer Prize for Fiction, and most recently, Break the Skin, as well as two other memoirs, Turning Bones and From Our House, both available from the University of Nebraska Press.